Tomorrow is your last chance to grab a copy of The Stephanies and support First Book. We’re sharing half our profits from the month of November with First Book, and with tomorrow being the last day of the month, it’s your last chance. 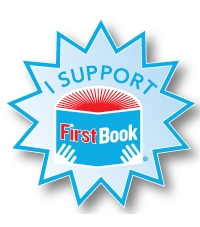 First Book is an organization that gives kids in need access to books. What’s so great about books? Aside from being awesome, literacy is the best predictor of a child’s future success. If they can read, they’re more likely to do better in life. The biggest barrier to literacy is not having access to books. It’s kind of a simple—if a kid can’t get easy access to a book, they’re not going to learn how to read. So First Book is about giving kids that first book, giving them access to books so they can learn how to read so they can do better in life. It’s simple, but it’s awesome. For $10 they can donate four new books, so hopefully we’ll be able to give a few books. It’s kind of cool to not only write a book, but to help others learn how to read books. The idea of not having books is kind of unfathomable to me. We have literally thousands of books in our house. The kids both have at least a hundred books in their rooms. We like books. I hope in some small way we can pass on that love. So if you haven’t done it yet, grab a copy of The Stephanies. We’ve got the original paperback, a “Color-Your-Own” version, and digital versions for the Kindle, iBook & Nook, and the standard PDF version. We’ll donate 50% of the profits to First Book.